Horfield Organic Community Orchard is home to several very local apple varieties, e.g. Gloucestershire Underleaf, Court of Wick and Shepperdine Silt. 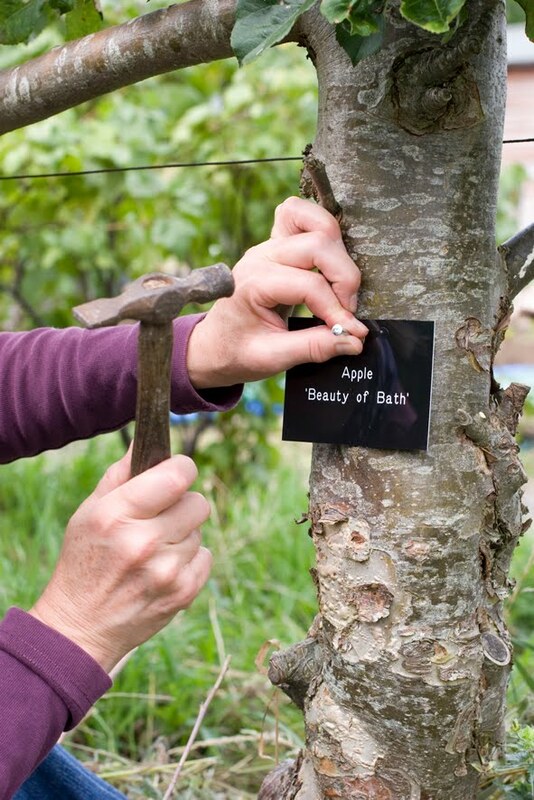 Heritage Lottery Funding of the Orchard Roots Bristol Project means that more than 70 different varieties of apple, pear, plum and nut trees in the orchard are being permanently labelled – making it easier for members and public to appreciate the diversity of fruit grown. Several varieties, first discovered on the site in 1998, have been sent for identification to the National Fruit Collection at Brogdale. Members hope that one or two of these ‘mystery’ fruits will reveal a strong local heritage. 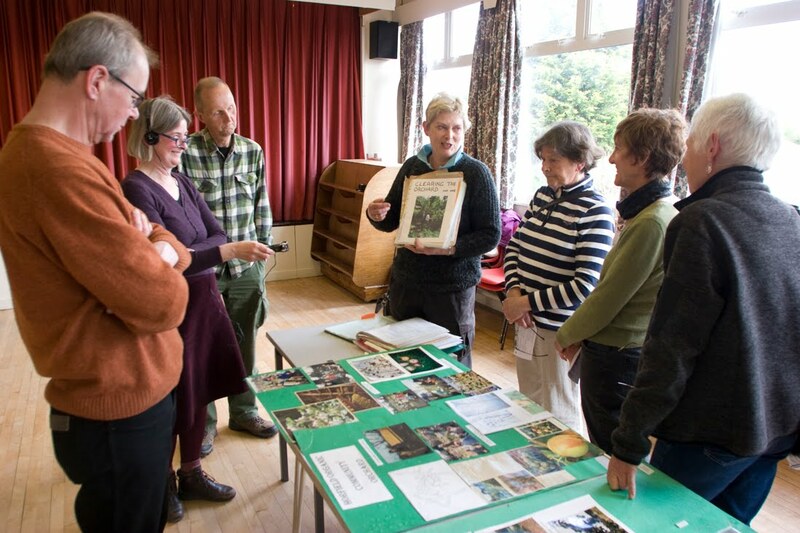 A ‘Know your Orchard Roots Bristol' event in the orchard on 8 June was attended by over 100 people of all ages. The group set up an outdoor photographic and recording area for the occasion, gave tours of the orchard, and answered many fruit-growing questions. We gathered some great stories from people with personal and family connections to market gardens near Bristol’s 'Blue Finger', local allotments, and Long Ashton Research Station (active in studying and improving commercial cider production, fruit growing, and preservation). Here's some photos from the day - Orchard Roots Bristol Event June 2013.
founding, long-standing and new - got together at the end of April to recount and record their stories and experiences from different phases of HOCO. Hearing a wide range of stories from many founding HOCO members has been instructive and inspiring. Highlights from these stories, and digitally reproduced photographs taken by members over the years, will be exhibited at public events and on the website. Horfield Organic Community Orchard (HOCO) has reasons to be cheerful in 2013. It’s fifteen years since a group of dedicated volunteers first began to reclaim a neglected and overgrown corner of an allotment site. Members are celebrating the 15th anniversary with the help of a grant from the Heritage Lottery Fund. Orchard Roots Bristol (ORB) is a community history project to explore, and celebrate, the living heritage of fruit growing in the Golden Hill area of Bristol. ORB also traces the roots back to traditional orchards in Bristol and beyond - particularly into Gloucestershire and Somerset. Taking place during a growing season, the project promises to be as richly layered as a good compost heap. Using a range of methods and events HOCO members have tapped into connections to foods with roots in the soil beneath the city, to record stories of local residents, pioneering members of the community orchard, a landscape, and its fruiting trees. These stories will be shared at orchard open days, through the creation of learning activities, maps, displays, and an enhanced website. What goes around comes around - ORB aims to cultivate community knowledge and local heritage to educate, and to inspire participation in local food growing. The grand finale to ORB is a special Apple Day celebration in the orchard on Sunday 20 October, when the stories gathered during the summer will be featured and shared with the wider public. A new guide to the orchard will be available, to be followed up by a multi-layered website map that supports deeper delving into the history and horticulture of each fruit.